This breathtaking, award-winning, wedding photograph was captured in the Somerly Room at the fabulous Fox Hollow Inn in Woodbury, New York. This recently-renovated room has this beautiful sculptured wall with LED spotlighting built into the ceiling above. I was able to capture this image using just the LED lighting, by placing the bride directly under the center spot light and having her bring her face and eyes up towards the light. 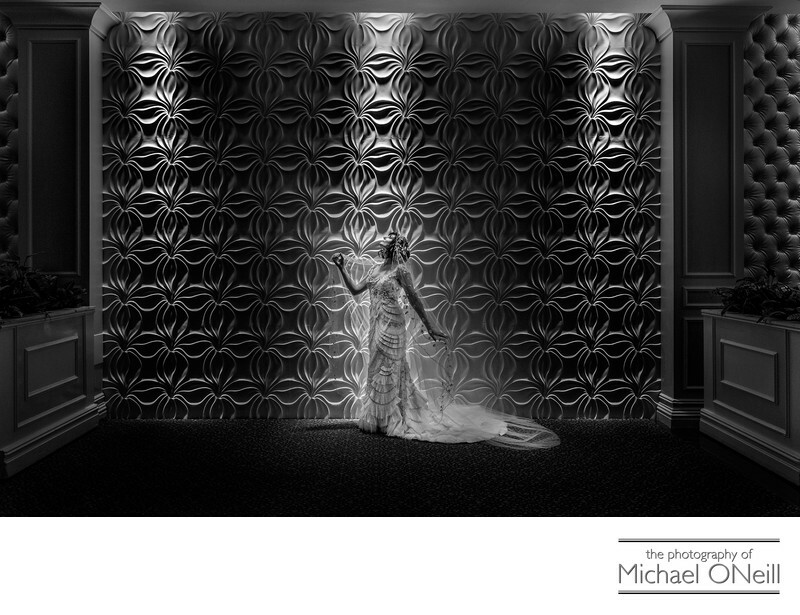 The direct spot lighting creates incredible depth of detail in the bride’s dress and the wall behind her. Adding to this detail is the use of the latest digital imaging technology…mirrorless cameras. Digital cameras have been in the wedding and portrait photography arena for almost 20 years now and their designs haven’t really changed that much. Sure, as with any technology, improvements have been made. But just as sure, designs will become obsolete and newer better technology will replace the old. In 2001 I made the switch from film to digital, being one of the first in this industry to do so. In 2017 I am once again leading the charge into the mirrorless camera world. I can’t possibly explain all the advantages in this brief piece, but suffice it to say that the amazing new cameras will enable me to stay on the cutting edge of technology while offering my clients an even better product. I am very excited about using this new technology in my professional wedding photography.